When I was young I wanted a lot: designer jeans, cool shoes, makeup, and cash in my pocket. Well, my dad reminded me every day that those things cost money and that nobody is going to just give you anything—you have to earn it. Now at the time I wish he would just let me fantasize a little and believe that these things would just magically appear, but not my dad. If you wanted it, you had to save for it since there were no credit cards used in our household. How much money are you earning each month, and where does it go? Are you prioritizing your spending, or do your dollars simply disappear without you telling them where they should go? Take control of your personal finances early, and you’ll have control of your money for life. Budgets can be simple, as long as they work for you. My favorite idea was to offer ‘loans’ to your kids against the money they make on chores. Charging an interest rate on these loans and talking to your kids about the real cost of borrowing will really help them prepare for when they have credit cards and other loans available in the real world. I’d say it’s one of the most important things you can teach your kids before they go out on their own, to understand the real cost of borrowed money. Speaking as a 26 yr old, if I could explain one thing to 18 yr old me, it would be the true power of investing over simply saving. Every dollar they invest now will be worth 10 times what it would have been worth sitting in a savings account by retirement age. One of the biggest mistakes is using student loans to pay for things they don’t really need. Some students just say, “Hey, I can take out these student loans and use them for a spring break trip. I can worry about paying it back later.” Of course, this is generally a terrible idea that students will regret later (after the interest has piled on). I’d recommend parents really sit down and help their kids understand the impact of the impact of student loan and credit card debt. Parents are in a great position to help their kids track student loan debt balances throughout college rather than leaving them to be shocked when they get the bill after college. Do some math using our calculators to show them just how much they’re on the hook for in monthly student loan payments. Adam Carroll, the creator of the documentary Broke, Busted & Disgusted, shared about how you should allow your children to struggle with money if you really want them to learn how to manage it. In my research for the documentary Broke, Busted & Disgusted I found that most 18 year olds that we interviewed had never HAD to make a financial decision on their own. Even simple ones were almost always made for them. And now they were facing the largest financial decision of their lives (short of buying a home) with little to no background in how to make it. The simple fix I’ve found at home is pushing the financial decision making down to the kids’ level. As an example, when it’s time to buy school clothes, many families would head to the mall with a budget in mind and come back spending more than they intended. Instead, consider setting the budget and handing the money over to your teen with the instruction that, “When this is gone, it’s gone. So you’re going to have to budget your purchases accordingly. If you have any left over at the end, it’s yours to keep.” Without sugar-coating it, it’s rocky at first. But the moment your kid ‘gets’ it, it’s a magical thing. I think this is the best advice about teaching kids about money. 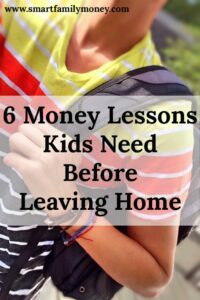 I’m going to do my best to allow my kids access to real money so they can have chances to make real mistakes while still living at home. I’d much rather that my kids run out of money while back-to-school shopping than make huge mistakes with lifelong consequences in their young adult years. Do you have any advice about raising money-smart young adults? What do you wish you’d been taught as a teen? Comment below! Great tips, Cindy! I’m honored to be included, and trusted as one to turn to for advice! It sounds like you’re doing well with your kids. Keep setting that great example, they’ll learn more by your actions than by your words! Thanks again! Thanks for your help with this post! Actually I’m not a kid anymore, I’m a 21-yr old woman. But, I’m glad at this age I’m reading this of article to help me and enhance my knowledge about finance. I remember when I was just 17-years old my mom let me enter to this part time job in events, actually I earned more than her. But, that time I don’t know how to manage my money back then and ever since I spend for myself but sadly I didn’t save. When I finished my college and had my first job then slowly I’m learning how to handle my money. I find this very informative and helpful for me and even for the future when I have my own kids. 🙂 Lovely Blog! I am glad you found the post helpful, Esther! Thanks for stopping by!